Keillor Point formerly referred to as “The End of the World” is a site above the now-closed Keillor Road. Keillor Point is located at the top of the river bank on Saskatchewan Drive in the Belgravia neighbourhood, above the former Keillor Road. Construction on Keillor Point, commonly referred to as ‘End of the World’ is scheduled to begin in later October 2018. The approved design of Keillor Point includes construction of a staircase, formalized viewing area and granular trail. This development will create a safe, accessible and welcoming place for people to enjoy the view of Edmonton’s beautiful river valley. Following closure of the old Keillor Road, large pillars from a retaining wall remain in the river valley bank. This location became a popular location for people to view Edmonton’s river valley and west Edmonton, despite the site restrictions and prohibited access signage. Recession and slumping of the embankment, along with deterioration of the pillars, present a significant safety hazard. 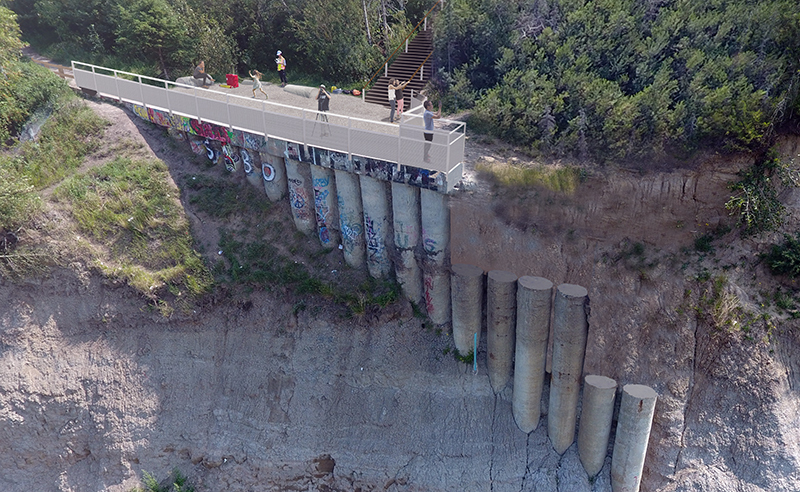 A study was conducted on slope stability which recommended that a viewpoint be constructed on top of the current concrete pillars using the existing trails for access. The study also informed that vegetation on top of the bank should be left to help maintain slope stability. Improvements were suggested for access routes, railings and a viewing area. All improvements considered will ensure safety and security at this location. The City of Edmonton Naming Committee approved the name Keillor Point for this project site. Detailed Design of the Keillor Point Viewing Area was completed in August 2018 and funding for construction was approved in September 2018. Construction is anticipated to take approximately 3 months. In Fall 2015, the public was invited to participate in a survey looking for feedback on the options for development of a viewpoint at the site location. The outcome of the survey guided decisions to develop a concept design. The Belgravia sub-committee group was engaged with the design team throughout the concept design phase. Meeting #3 - Present Concept Design to the five homeowners on Saskatchewan Drive who are most impacted by the End of the World site.